I’ve been trying to decide which gloves to review first because there are so many pairs that I love. I’ve decided on the Gerbing Core Heat S2 Battery Heated Gloves because I feel like they’re one of the best all-round gloves. This is one of the best all-round gloves on the market. It scored pretty well in every category and I would recommend this pair of gloves without a doubt. I would say that it’s probably ideal as a ski or snowboard glove but you can wear it for almost any type of activity. I always put the gloves through a rigorous test in order to get the most acurate and in-depth review. These Gerbing gloves did not disappoint. The glove itself is a nylon material with a leather palm which is very nice. It also has the full gauntlet so that you don’t get that pesky snow up your sleeve. These gloves are really comfortable and not just for heated gloves, for any gloves. I love that they have a fairly low profile especially considering how warm they were. They were comfortable enough to wear all day long without issue. The heat is distributed nicely on the front and back of the hands as well as all along each finger. Including the thumb. The heat is transfered by Gerbing’s own Microwire Heating technology. I found that the high heat was too warm for the temperature I used these in. The day I tested them it was 20 Degrees(F)/-7 Degrees(C). It is really nice that the temperature of these gloves can be adjusted rather than just having an on/off switch. I ended up finding a nice comfortable setting at about 75% of the heat capacity. My hand never got sweaty at that setting and never felt clammy. Gerbing claims that these gloves are breathable and I’d have to say that based on my dry hands, it’s true. They get a 17/20 for comfort and the only reason I docked them a few points was because when I took them off they turned inside out and then they were hard to get back on and a little bunched up inside until I wiggled my hands around a bit. I gave them a 17/20 for warmth because they were very warm but when the heat was on high I didn’t find it crazy hot. So if it had be an extremely cold day I’m not sure they would have been toasty warm. They seemed to lose the heat quite fast when the heat was off. They did really well in the water test. I always make sure to handle the snow a lot at first and melt the snow in the glove to see how they hold up. No water got through with that test. Then I submerge all of the fingers in water to see how they hold up. They kept the water out fine but I found that the exterior of the glove did absorb a little bit of water making the gloves heavy and less comfortable. That’s the reason I docked 3 points in this category. These gloves seem very well built. You can see the quality stitching if you look closely and you can feel the strength in the material. As for longevity, I cannot personally tell you how long these last as I only used them for 2 days so that I could write a review. I have however read a lot of other online reviews and from the sounds of it they stand up to the test of time. There were the odd people online complaining about the batteries crapping out after a few months but not very many. This shouldn’t be a concern for you because Gerbing is a reliable brand and I’ve always had good experiences with their customer service. For this reason I’m giving them a 16/20 in this category. It has a lithium ion rechargeable 7v battery. The battery life of these heated gloves wasn’t too bad. I ran them at full temperature until they died just to test them out and they lasted 3 hours and 25 minutes. This is actually more than Gerbing says you’ll get from them so I was surprised. At 75% capacity the battery was a little better and lasted 4 hours. At 50% capacity I was able to get 4 hours and 25 minutes. At 25% capacity I was able to get 8 hours. This is above average for heated gloves and I find that it’s sufficient if you monitor them properly. Usually when I’m wearing heated gloves I don’t run the heat constantly. I like to turn the heat on high at first, then when my hands are toasty warm I shut them off for a while. Then I just turn them up or down throughout the day depending on the conditions. This is a good way to go because then I can get an entire day out of the battery life. As for charging the battery, it took roughly 6 hours to charge from dead to full life. That’s not great, but still acceptable. Given these factors, I gave them a 15/20 in this category because I’d like to get at least 6 hours out of a heated glove on full heat. I found that these gloves fit true to size but I did notice that a few people complained that they fit slightly small. Your best bet is to use our Sizing Guide and measure your hand before making your purchase. I find that the sizing guide is simple to use and prevents buying the wrong size 99% of the time. I have to say that I really do like these gloves. I wouldn’t recommend them as a motorcycle glove simply because they don’t provide protection in case of a crash. Other than that I’d say that they are good for most applications. I would highly recommend them for skiing, snowboarding, walking, hiking, shovelling snow, driving, snowmobilling and just playing around in the snow. Two little features that they don’t have are the nose wipe and the touchscreen capability. Not a big deal but I’m a big fan of both of those features and I missed them with these gloves. If you have any questions about the Gerbing Core Heat S2 battery Heated Gloves please don’t hesitate to ask using the form below. I always try to respond ASAP. Also if you’ve tried these gloves I’d love to hear about your experience and let me know if there are any other gloves you’d like me to add to my reviews. Here’s a couple more pictures. I bet the part of the world you live in has extreme weather conditions and probably way too cold for me in Manchester England. However, you do seem to have found a way around cold hands. Your review on the glove Gerbing core heat S2 is very thorough, and if I need to keep warm in extreme conditions – this is the website for me. Thanks very much for the comment. Yes it’s a product that a lot of people have never heard of. With that being said, it’s not a new idea. Heated gloves have been on the market for a few years now and a lot of people are buying them. It’s not a gimmick, it’s a very effective way to keep warm. Oh these look so interesting. I never even knew that you couldget gloves that heat up! I suppose I should have guessed. I stumbled across your post because my husband is always asking me for gloves in winter for when he rides his motorbike to work. We don’t get such extreme cold here, no snow or anything really but when you are riding a motorbike in winter early in the morning it can get quite chilly if you don’t have gloves or if the gloves are bad quality. This looks like something my hubby would just love! he always says he can’t move his fingers when he gets to work in winter. Now he’ll be snug as a bug. Thank you for making me aware of these awesome gloves! Thanks for the kind words. It’s true that when on a motorcycle your hands can get cold even if it’s not that cold outside. I ride a motorcycle myself so I’ve had cold hands while riding s lot. Keep checking back here at The Warmest Gloves because we’ll be reviewing lots of new gloves and even lots of heated gloves specifically designed for motorcycle riders. The is a difference because when on a motorbike you need good dexterity as well as protection. Some motorbikes come with heated grips which work well but there are still a lot of riders out there who don’t want to go through the trouble or spend the money to get heated grips installed on their bike. For those people, battery heated gloves are the perfect solution. This is something completely new to me, never heard about gloves on batteries. I was first skeptical after seeing the title, but your texts shows me this is a real thing. I would not buy for myself, but my wife always has the issue of cold hands. I just told her about this and got a request to buy them for her as a birthday present. I might really do this, very interesting, thanks a lot. Thanks very much. Yes a lot of people have never heard of these before. All you have to do is a simple Google search and you’ll see that there are a lot of different types of heated gloves from a lot of different brands. Some of them are well known brands and some of them are small brands specializing in the heated gloves only. Thats great that your wife is interested in a pair of these. Make sure you do your research And get the right pair because there are a lot of different styles that work better for different applications. Good luck. These look like great gloves. I am looking for a pair to go skiing with. Winter is coming soon in Australia and I am going on holiday to the snow. My hands get really cold and sore. I have yet to find a glove that is comfortable and warm. Your review of these gloves gives me some idea if they will suit me. Like you, I prefer to have the nose wipe and touchscreen capability as I find it cold indoors as well. Can you recommend any gloves with these added features? Thanks for your comment and question. So far out of the gloves I’ve reviewed my favorite pair of gloves that has the wipe and touchscreen ability is the Glovii liner. Now be aware that this one is only a liner so it’s not completely waterproof. Asside from that it’s a great pair of heated gloves. Have a look at my review of it to see if you thinks it’s right for you. Thanks again and good luck. Wow, those Gerbing Core Heat S2 Battery Heated Gloves seem to be the thing to use when the hard winter comes. And the price is not a breaking monster. Your recommended pair of gloves seems very well designed and manufactured. They look comfortable and very warm.The water resistance and battery wraps it up for a high quality feeling. Thanks for the comment. Yes you’re right they are very warm and comfortable. I’m always happy to hear people like you get excited about the idea of heated gloves. It’s really amazing what a little battery power can do for a persons mood. It just makes working or recreating that much more attainable in the winter months. No more cold hands and no more bulky winter gloves. Cheers. My stepson has Raynaud’s disease which is an issues with his circulation, where even temps in the 40’s can cause his fingers to become blue and and become quite painful. Needless to say he is very susceptible to frost bite. So heated gloves would be a big help. How do these gloves do with handling small items, like holding screws and tools? He likes to work on his motorcycle and VW bug, but when it is a bit cool out it is difficult for him to work the tools and handle the nuts and bolts because his hands get so cold. Will these gloves allow him to work on his vehicles or do you know of any gloves that would work? Thanks very much for the comment. There are in fact quite a few options for “work” gloves that are heated. There are all sorts of different types with varying degrees of warmth and dexterity. Have a look at This Link to browse all of the options. up and has a battery pack. I like also that you provided a sizing chart for unisex. If looks so beautiful up there with the snow and it looks sooo very cold also. Great information about heated gloves, I learned something new today. This is one of the best all-round gloves I have ever seen. I was in Iceland and this type of gloves would have come in handy. I took a pair of gloves (don’t remember which brand they were) but they were awful, my fingers were freezing and that made the trip less enjoyable. I like the fact that the hands won’t get sweaty,that way I know I don’t only have to use them when I travel to cold countries. You’ve just made my biggest point that I love to make. You said that better gloves would have made your trip more enjoyable. I truly believe this is true. So many times people cut activities short or only focus on the fact that they have cold hands instead of enjoying the moment. A better pair of gloves and more particularly a pair of heated gloves will truly improve your experiences and let you extend activities for a longer period of time. Thank you very much for pointing this out. Well reviewed! You’ve convinced me to buy these gloves already. The way you explain how it benefits me is very great and well organised. I like to read reviews that also include other people’s reviews. Like that, I can get the product status from many other point of view, so I can make my decision more accurate. Thanks very much. I always try to be as thorough as I can because I want to help make your decision easier so that you get the right gloves. I’ve never heard of battery heated gloves till now. What a great idea. I work outside quite often, which is great in the summer, but not so good this time of year. Battery heated gloves would be ideal – although I would need a spare battery pack to get me through an 8 hour shift I think. Do you know if they do battery heated work gloves – or is it just ski gloves? Yes with this pair you’d probably need a spare battery pack to get you through 8 hours but that’s only if you have the heat on high the whole day which usually isn’t necessary. Most of the time people rotate from high to low and sometimes off as the body temperature heats up and you no longer need the heat. Especially if you’re working. Ya I’ve actually reviewed a few different winter work gloves. One of them is heated and they’re called Volt Heated Work gloves. 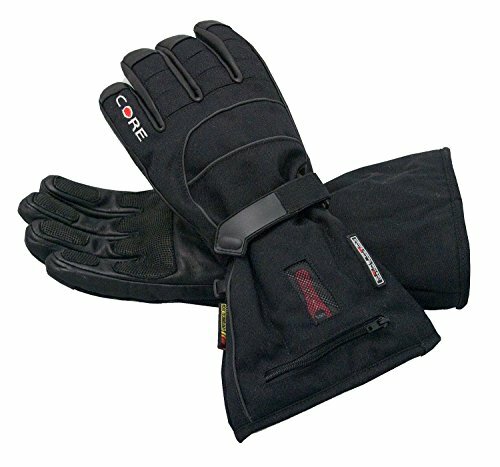 The other two pairs of winter work gloves that I would recommend are the Heritage work gloves and the Carhart Winter Work gloves. All really good options. Stay away from Gerbing. Their quality is very bad. They’ve moved their company through holding companies to avoid fulfilling their lifetime warranties. This has happened twice in the last 10 years now.